Apologies for the radio silence but I really have been incredibly busy recently, mostly writing about Artificial Intelligence, Big Data and the Internet of Things. Here’s a piece that was published in a Sunday Telegraph supplement yesterday (November 25th, 2018) about how the NHS can use AI technology to save money and improve its service – especially important given the increased pressure it is under from us all living longer. According to Frost & Sullivan’s Social Innovation in Healthcare report, the number of people aged 65 or older worldwide is projected to grow from an estimated 524 million in 2010 to nearly 1.5 billion in 2050. And during this period, total health and long term care costs are set to double to nearly 13pc of GDP among OECD countries. Although not without its problems – as a recent investigation by the Information Commissioner’s Office (ICO) into the Royal Free London NHS Foundation Trust sending data to Google’s DeepMind showed – technology can help bridge this funding gap by making health services run more efficiently, diagnosing illnesses more quickly, even providing care for the elderly. According to a recent report by former health minister Lord Darzi, the NHS could save £12.5bn a year by fully automating repetitive and administrative tasks, such as communicating medical notes, booking appointments and processing prescriptions. In September, the UK Government also announced £17million of funding for projects that it claims could revolutionise healthcare. These included a program combining AI and GPS tracking to match the availability of beds and porters in hospitals as well as a 3D printing technology for tablets and smartphone apps to monitor and improve the treatment of long-term complex wounds. This year the Goodwood Festival of Speed (FOS) celebrated its Silver Anniversary. During this time it has firmly established itself as the UK’s premier motor show, beating off competition from the British International Motor Show held at various venues in its long history from 1903 to 2008. It’s not difficult to see the appeal either. Rather than just viewing cars in a sterile exhibition hall, like Birmingham’s NEC (where I spent many a happy year with my Dad back in the 1970s), you actually get to see, even sit inside, a lot of the cars in the open in a massive setting. Great if it’s lovely and sunny like it was last weekend, not so good perhaps in the pouring rain which we normally experience in the final week of Wimbledon! So big a setting is Goodwood in fact that it takes you several hours to cover the various areas on foot (and a fair amount of time to get in the venue too if you are driving which most people are). Think of it as the Glastonbury for car buffs with various fields dedicated to different types of cars – much like different musical genres or bands. Some people even camp all weekend, as with a music festival, because there really is such a lot to look at. Best of all you can see many of the cars racing throughout the day up the famous Goodwood Hill Climb – a stretch of race track measuring 1.86Km (1.16 miles) taking you past the beautiful Goodwood House, the seat of the Duke of Richmond. As well as thousands of classic cars, race cars, motorbikes and even some planes and helicopters, all the major car manufacturers have vast stands at Goodwood (I was at this year’s show as a guest of Ford). This included Tesla which was showing off its latest, ‘affordable’ electric Model 3 car which should be available next year for a price of around £35,000. There’s also a section at Goodwood called the Future Lab where you can see future developments in travel. Here I got to play with a very shiny lunar module from Japan-based iSpace which is hoping to become the first private company to launch a module to investigate the surface of the moon in 2020. Pictured with the latest and very powerful Ford Mustang which I got to drive around during the Goodwood Festival of Speed, courtesy of Ford. I also got to see the latest delivery drones used by companies such as DHL to take parcels to remote areas which are difficult to access by road (ie. the Swiss Alps) as well as a completely autonomous race car called Roborace (pictured at the top of the page and below). Indeed at this year’s Goodwood Festival of Speed Roborace made history by becoming the very first car to achieve the Goodwood Hill Climb without a driver (not even a midget one hidden inside as someone suggested). Designed by Daniel Simon, the automotive futurist best known for his work in Hollywood films such as Oblivion and Tron, the extremely low-slung vehicle (it’s amazing how low you can make it when you don’t need a human) expertly navigated flint walls and bales of hay on the Goodwood estate using a variety of sensors on Friday 13th of all days! Roborace’s time wasn’t too shoddy either, averaging a little over 60 miles per hour to complete the testing course in around 1 minute 30 seconds (OK it’s a little off the record of 41.6 seconds set by a racing driver, but it’s still not bad). Unfortunately the same couldn’t be said for the semi-autonomous Ford Mustang with humans inside. Developed by Siemens in conjunction with engineers from Cranfield University, it did eventually make it to the top of the hill but only in a time of over 4 minutes and only after an altercation with several bales of hay – see pic below. While the future of cars on the road may well be autonomous it seems we’ve got a few more years of enjoying car shows like the Goodwood Festival of Speed, complete with fully functioning human drivers on the road, first! Just got back from a great trip with Audi taking their latest A6 for a spin around the mountain roads of the Douro Valley near Porto. I’m going to write a full review next week, but suffice to say for now it’s a great car – although probably one for the corporate executive who is more likely to be at home on the motorway than on mountainous country roads! For a start it’s quite a big beast of a motor, plenty of room inside and quite wide. However, it handles very well and comes with plenty of power (3 litre engine as standard though a smaller 2 litre is available). I liked it primarily because of the onboard tech which is getting more and more advanced. There’s touch screen control with haptic response of course (so you can feel the movement of the buttons) as well as voice control. Press the talk button on the steering wheel and ask for a pizza restaurant and it will tell you where the nearest one is. Say you are feeling cold and it will even turn the heating up automatically for you in the cabin. There are also a whole host of great assist features for driving including 360 degree cameras which really help with parking and assisted cruise control which will keep you a safe distance from the vehicle in front. It really is quite a clever car although all of this intelligence doesn’t come cheap so you better get saving! You can read the full review on Shiny Shiny here. Agile working can help boost productivity and improve staff morale, but companies need to plan their strategy carefully so that it doesn’t become a disorganised mess. That’s the conclusion of a piece I’ve written for The Telegraph here. In the 20th century, organisations that wanted to succeed needed to make sure that all employees turned up to a place of work during designated hours, usually between 9am and 5pm. However, with advances in technology, particularly smartphones and faster home broadband, this is no longer the case. Today, it’s often argued that flexibility helps organisations get more from their teams. Many businesses now offer flexible working to help individual employees with their work/life balance, while some go much further, implementing ‘‘agile working’’ practices to enable all staff to work wherever and whenever they want, with the help of the latest technologies. But does agile working really allow staff to work more smartly and collaborate on projects more easily or does it just lead to increased confusion and greater security risks? You can read the full piece here. I recently went to the very lovely Coworth Park near Ascot, on the borders of Berkshire and Surrey. It’s a strange part of the world in some ways, a beautiful bit of countryside nestled between some not so beautiful parts of the world – I’m looking at you Bracknell and Slough! Like a lot of country houses that have been converted into hotels, Coworth Park is predictably stunning. But what I thought was amazing was the attention to detail, from the sweeping wooden staircase to the interior control lighting in each of the bedrooms and a free standing copper bath in the bathroom. Then of course there’s the spa which is quite simply out of this world – especially the large and beautifully lit pool which you can see pictured above. I was there with a company called DS Automobiles who I must admit I knew very little about before going on the trip. But basically it’s a luxury car brand from France named after the iconic Citroen DS, first launched in the 1950s. And although it’s difficult to get as excited by the design of the latest DS car, the DS 7 Crossback SUV (pictured above in the grounds on a rainy Wednesday), there’s no denying it’s a luxurious vehicle inside. Quite simply it’s stuffed to the gills with tech including 14 Focal loudspeakers and a load of semi-autonomous driving and safety features including Night Vision mode (handy if you don’t want to run over deer on the country roads). What I particularly liked though were the car’s massage seats which were very comfortable indeed – perhaps a little too comfortable for driving – and the detailing of the interior upholstery. Like Coworth Park itself, there’s certainly no shortage of luxury with this latest DS car – a lot more Ascot than Slough. Are dockless bikes the future for city transport? Although I’m not a cyclist by any means, I am fascinated by the culture around cycling. In particular, the whole rise of dockless bikes systems which I must admit I knew nothing about until I met up with the guys from Ofo. It’s actually a fascinating company. Started in China about four years, Ofo (so called because the letters look a little like a person cycling) is now available in 20 countries and around 250 cities (Sheffield being the latest one in the UK, following on from the roll out in Cambridge, Oxford, Norwich and parts of London). Using the app, you can locate the bright yellow bikes on the street (they are shown as yellow dots on the map). As long as you’ve got your credit card details stored, you can then unlock the bike by scanning in its QR code. Prices seem very good: 50p for half an hour (compared with £2 on a Boris Bike) and the bike itself is lightweight with a shopping basket, lights (powered by a dynamo) and three gears – good enough for most areas of London. The only downside is that the punctureless tyres are a little hard which can make the ride a bit of a bone shaker, especially if you are going over cobbled streets. Beatboxing in 360 VR. Whatever next? I may be showing my age, but when I first started off as a tech journalist back in the early 1990s, TVs were virtually square, weighed a ton, and most people were listening to grunge music coming out of Seattle. Nearly 30 years later, everyone has a super light flat widescreen TV and early adopters (admittedly mostly gamers at the moment) are getting into virtual reality headsets for an even more immersive experience. Thankfully the music has changed a fair bit too! For the last few weeks I’ve been working with Kodak, testing out its little VR camera, the Kodak PixPro 4K VR360 and looking for different types of content to shoot in 360 to do it justice. Obviously the first things that spring to mind are action videos which is why we went to Go Ape to film as well as a skateboard park in Tottenham. Both were great in showing off the immersive experience of 360 filming, although shooting with a camera strapped to your head or holding it as you negotiate a zip wire (especially if you a broken hand like my son did at the time) are never easy. Thankfully we didn’t break the camera though! However, what interests me are alternative uses for VR and 360 outside of the obvious genres. For example, YouTube now has its own virtual reality channel where you can check out thousands of the latest 360 videos in different categories. These include a live MTV version of Ed Sheeran singing Shape of You at the 2017 VMAs and, for those of a certain age, Duran Duran’s performing Hungry Like The Wolf filmed to commemorate this year’s Duran Duran Appreciation Day (#DDAD17) – who knew? 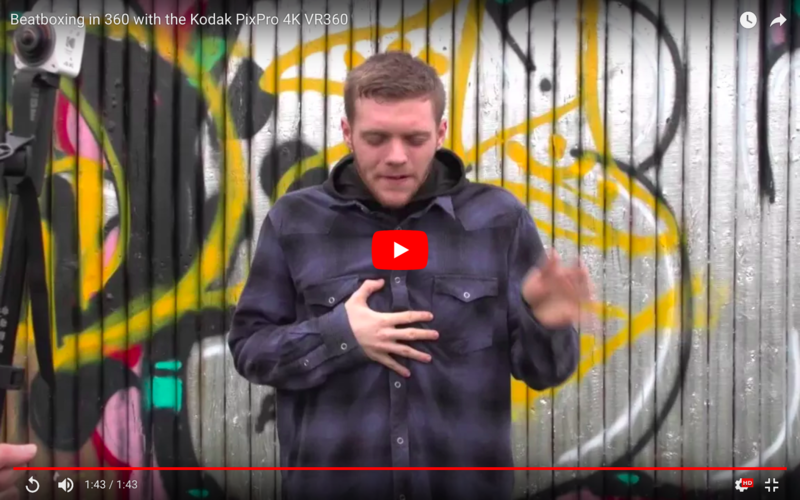 For our 360 video, filmed with the Kodak PixPro, we chose to hire the talents of our very own wolf: Frankie Rowley-Walker, a.k.a Wolfie. And while the audience is a little smaller than for Ed Sheeran and Duran Duran (just two cameramen and a stray dog), the experience is nevertheless very immersive. Sometimes I miss the early 1990s. But I must admit when it comes to the size of the TVs and the music, I much prefer 2017! You can see all of the videos shot with the Kodak PixPro camera here. Great to have a full page in yesterday’s Telegraph Business Section on money laundering. It’s such a massive topic at the moment and such a huge problem around the world – but especially in the UK because of its reputation as a financial services centre. Although money laundering has been around since the beginning of time, it’s now estimated to cost the UK government a whopping £80 billion a year in lost revenue – obviously money that could be spent on hospitals and schools. While technology, especially cryptocurrencies like Bitcoin, may be helping money launderers hide their ill gotten gains, it’s also helping banks and governments spot suspicious transactions more easily using artificial intelligence/machine learning. In this article I interview BAE Systems’ Rob Horton about how they are helping financial institutions to take a more proactive approach to detecting money laundering in their organisations. For the last few weeks my son Archie and I have been busy filming in and around London for a series of YouTube videos. You see, we’ve partnered with Kodak on two of my tech blogs, TechDigest.tv and ShinyShiny.tv to produce four themed videos designed to showcase what their latest VR camera, the Kodak 4K VR360 can do. Despite the weather not always being that great, it’s been good fun so far, acting like a tourist and filming the likes of Buckingham Palace and Big Ben. Yesterday we were in a nearby wood filming the leaves falling from the trees and dogs sniffing around the camera while next weekend sees us travelling to the newly opened Go Ape adventure park at Alexandra Palace to bring you VR footage from the high ropes. You can see our first ‘taster’ video below with another, London’s Top 10 VR landmarks, due later this week. While this first one isn’t filmed completely in VR, look out for future videos in the series for which you will need your Google Cardboard type headsets or Oculus Rift to enjoy fully. The follow-up to the 2014 movie sees Paddington in trouble once again, this time as he tries to get his paws on a pop up book for Aunt Lucy’s birthday. 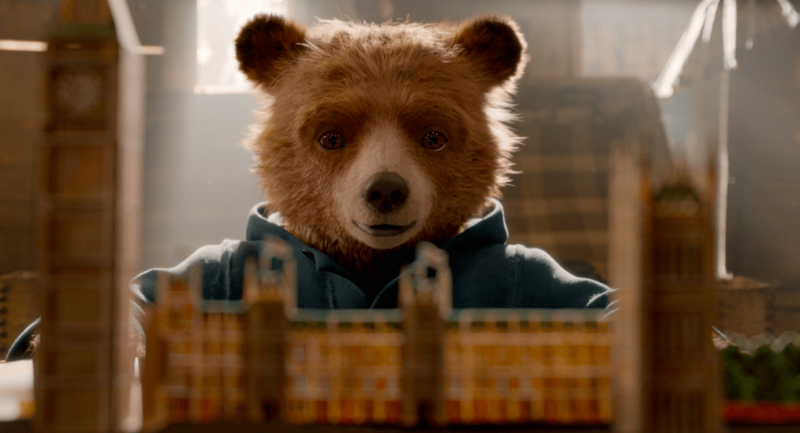 Paddington aficionado Chris Price reviews this perfect heart-warming family film for ShinyShiny.